In the year 632 CE, a learned Chinese monk made a journey by land from China to India in search of the original Buddhist scriptures and teachings. His name was Xuan Zang and he had believed that true Buddhist religion was being practiced only in India. He stayed at the Nalanda university, in present day Bihar state of India and had completed his learning of the true religion as per his belief. Every one knows this part of the history, yet very few understand that Xuan Zang's travelogues are perhaps our only guide books about the political, social and religious conditions of this region in those times. Xuan Zang had traveled to India by a route passing through present day Afghanistan. Being a Buddhist monk, he had considered that traveling through a particular region of present day Afghanistan was of paramount importance to him. This region was located to the south of the state of Bactria and part of the Hindukush mountain ranges and was known as Bamiyan. To visit Bamiyan and pay his respects to the Huge Buddha statues there, was of utmost importance to him. Xuen Zang has left detailed description about Bamiyan and the huge Buddha statues there in his travelogues. 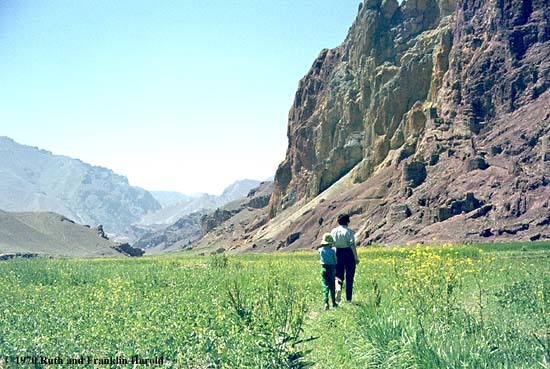 A traveller has mentioned that if heaven is to be ever found on Earth, it would be in Bamiyan only. The distant snow covered peaks from north and south, surrounding grayish-brownish mountain ranges with razor cut vertical cliffs from all sides and right in the middle a refreshing green river basin, which itself is at an height of 8000 feet, is how Bamiyan can be described. The river, the greenish-yellowish fields on both the banks, dotted with earthen forts make the landscape stunningly beautiful and picturesque and make it look as if a model has been laid out. Whenever anyone enters the Bamiyan valley, his mind automatically feels detached from the problems of his world, This might be the reason why Buddhist monks were attracted to Bamiyan in the first place. Even though Bamiyan appears, out of this world, in reality it was an important commercial outpost on the silk road in ancient or medieval times. 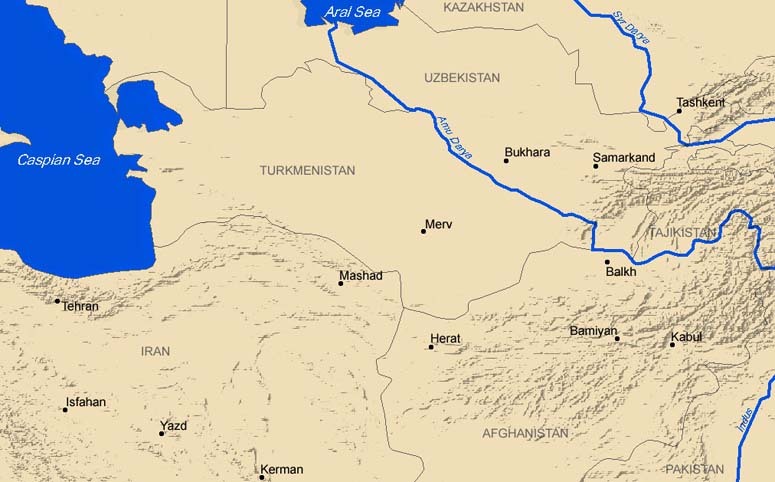 Almost all commercial caravans moving towards or from China or central Asia and going to or coming from west had passed through Bamiyan valley. This fact. 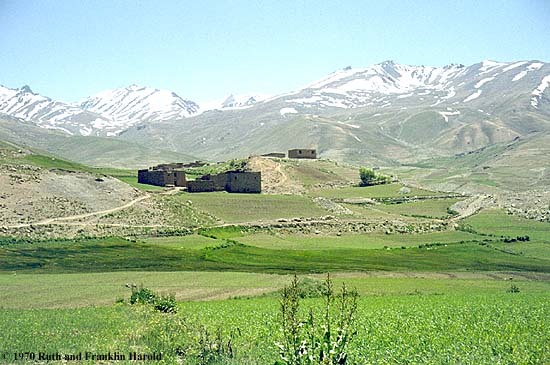 though brought great riches to Bamiyan, it also had to face aggressions, wars and destruction, throughout history. The ruins of innumerable number of forts is a reminder of this historic fact. 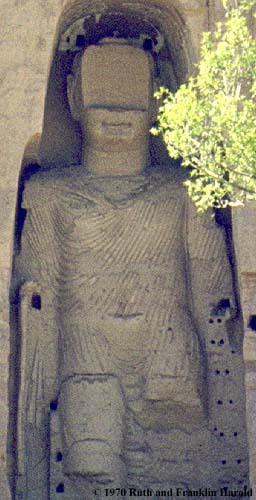 In the first century CE, Bamiyan was controlled by Kushan tribes from Bactria. These tribes, later moved out of Bactria and established their empire over a vast region starting from Caspian sea on the west to Peshawar city in Gandhar (Present day Pakistan)in the east. Kushan kings ruled over this region for next 300 years, bringing about great stability and prosperity there. Since Kushan kings were Buddhist, this religion found great encouragement in this region. During Kushan period only, Mahayan sect, which believed in wide spread and acceptance of Buddhism was established and Buddhist monks moved out in large numbers for spreading their religion. Some of the monks travelled to Bamiyan. When they experienced the picturesque beauty of Bamiyan and the aloofness generated in their minds by it, they decided to establish a Buddhist Vihara here. Slowly number of Buddhist monks in Bamiyan grew and eventually it became an important Buddhist learning center. Two huge Buddhist images were carved out on the vertical cliffs near Bamiyan in this period only. The archeologists used to differ over exact period , when Bamiyan Biddha's were sculptured. The new carbon dating method now, proves that smaller image was carved out in 507 CE and larger image was carved in 554 CE. 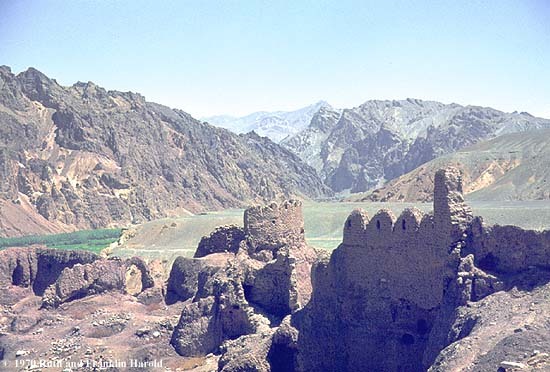 The calm and quiet of the affluent Bamiyan was destroyed for the first time in 1272 when great conqueror Genghis Khan sent a small army led by his grandson to capture Bamiyan. In the ensuing battle, the grandson was hit by an arrow and died. After learning about this, Genghis Khan was so angry that he sent his army to Bamiyan with orders that no human or animal should survive the onslought. The signs and remnants of the total ruin and destruction brought about are still visble in form of some of the ruined forts. Luckily, Genghis Khan's soldiers were scared of touching the Buddha images and these were saved. In the fifteenth century, then Amir of Afghanistan, Babur loved the beauty of Bamiyan and made efforts to bring back old glory to Bamiyan. However, since silk route trade had diminished now, Bamiyan remained in the backgrounds. When Aurangjeb came to power in Delhi, he tried to disfigure Bamiyan Buddhas. Luckily again his soldiers were not able to achieve much, except for slight disfigurement of the Buddha faces. In eighteenth and nineteenth century, a new trend of collecting antique objects became very fashionable in western world. Bamiyan was rich in such antique objects and was an easy target for looters, who made fast buck by selling these items to westerners. In 1998, Taliban, who can be said to be the big daddy of all destroyers, took control of Afghanistan. 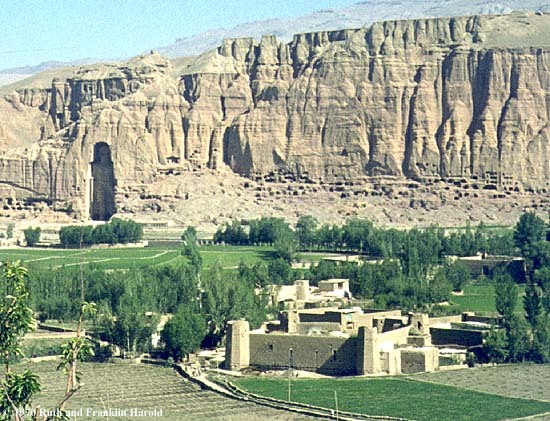 Taliban cadres were keen to destroy Bamiyan ever since 1998. 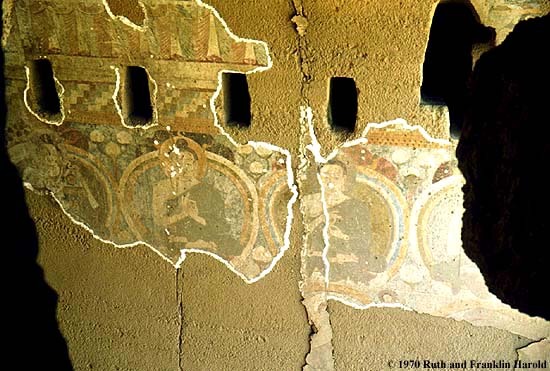 Initially Taliban had destroyed many small Buddha images carved in small caves on both sides of major Buddha images. The history lovers from all over world requested Afghanistan Taliban not to destroy Bamiyan Buddhas and make the world loose one of its historic monuments. This was of no avail. Finally in February 2001, Chief of Taliban in Afghanistan, Mulla Umar gave orders to destroy Bamyan Buddhas. 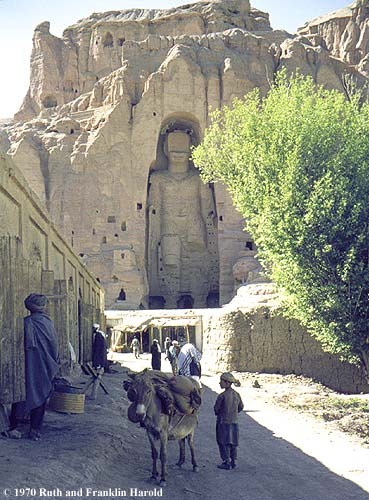 In March 2001, Taliban planted powerful mines near the Buddha images and both the images were destroyed and big heaps of crushed stone and loose earth was all that remained of Bamiyan Buddhas. In 2003, United nations declared Bamiyan as a world heritage site and efforts were started to save whatever remained at Bamiyan. The images are gone now. Efforts are now on to save the caves which once housed the images. Very recently it has been decided that Buddha images would not be reconstructed and empty caves would be maintained as a reminder of Taliban's actions. In 632 CE Xuan Zang had described that another sleeping Buddha image, which was 1000 feet long existed in Bamiyan. No trace of this image was ever found again. Since Xuan Zang is famous for his accurate description, many historians firmly believe about exsistance of third image. A joint Japanese-Afghanistan group has been working since last four or five years for excavation and restoration of Bamiyan antiques. In September 2008 an archeologist from this group, Anwar Khan Faize found out some remnants of a Buddha image at the foot of large standing Buddha images. This fact was pointed by him to chief of this group Zamar-ilahi- Tarazi, who then ordered more excavations at this spot. This image of Buddha was found out to be 64 feet long and can not be considered as the image given in Xuen Zang's description. Mr.Tarazi has found out recently after excavation, some traces of a Buddhist Vihara and a palace. It is hoped that after more excavations, some traces of the sleeping Buddha image may possibly be found. If these traces are really found, the world can have some consolation from the incalculable loss suffered by the mankind after having lost it's cultural heritage; the Bamiyan Buddhas.